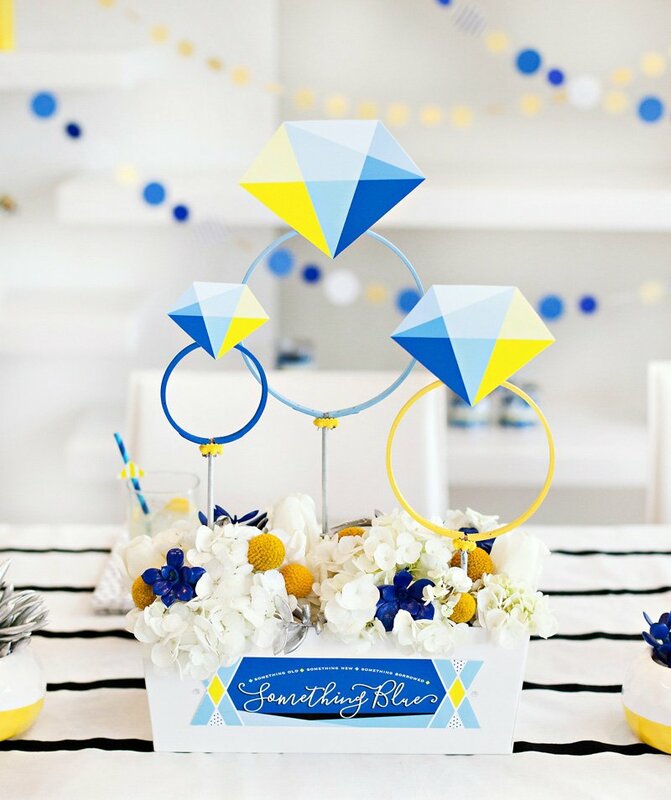 The lovely Tori Tait from Thoughtfully Simple created such a bright, happy celebration for her sister-in-law’s engagement soirée! 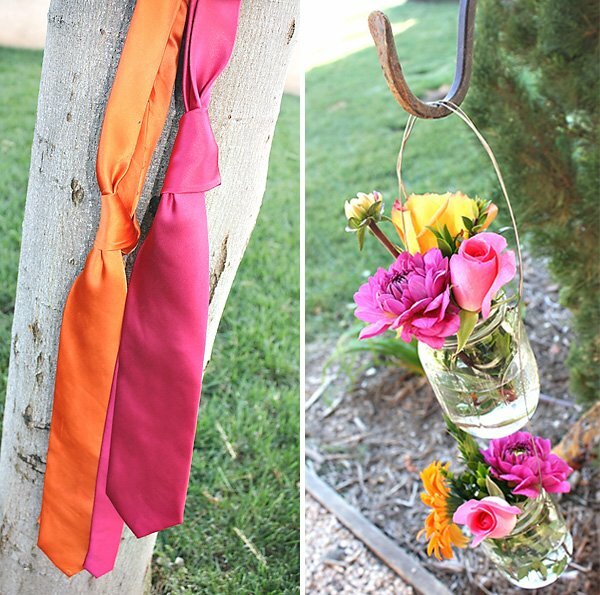 (Pretty lucky to get a party stylist for your sister-in-law, right?!) 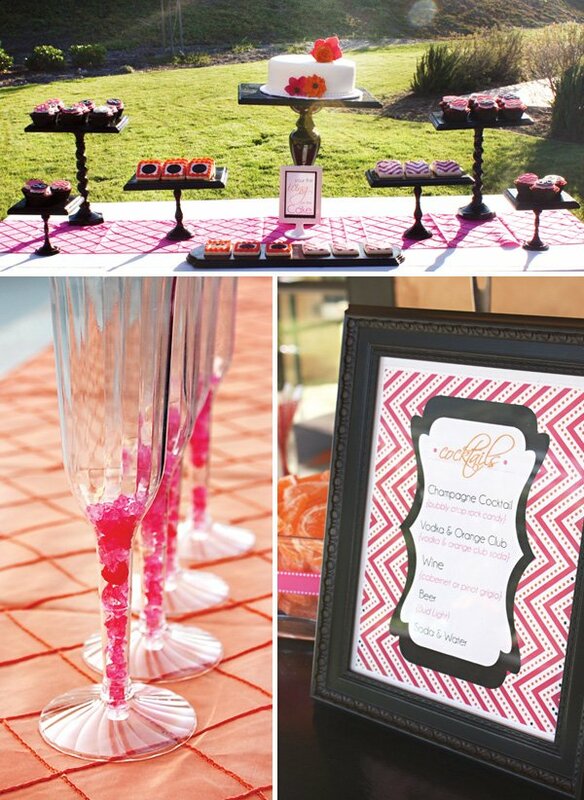 Everything about this party just looks like a blast… but let’s start with the fun signature drinks, shall we, which included a creative Champagne & ROCK CANDY cocktail and a bubbly Vodka Orange Club garnished with a cute stripey straw & jelly candy orange slice! 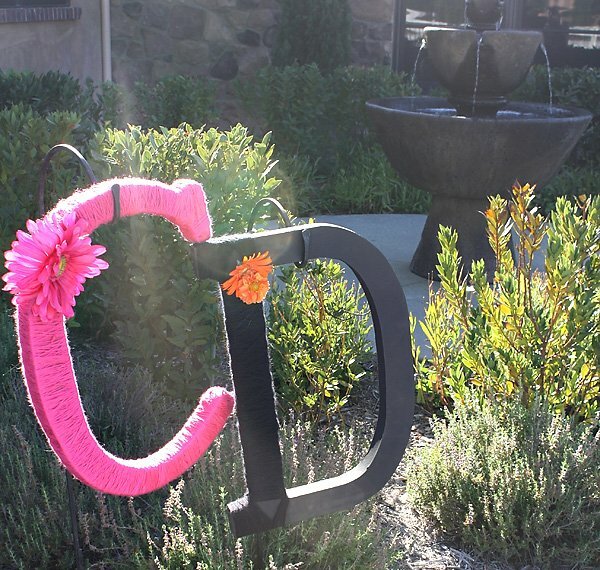 Aside from the fun fizzy drinks, some of my favorite elements from this party include the giant initials wrapped in yarn, cool chevron + polka dot paper elements, and the beautiful flowers that seem to be blossoming everywhere – from champagne flutes and table centerpieces to pretty mason jars hanging from shepherd hooks. 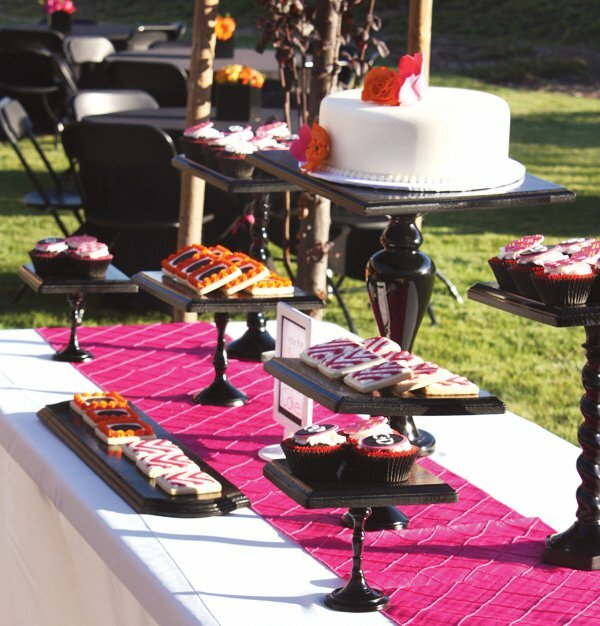 I’m especially loving the dessert table though – it had such a clean, modern look and featured fabulous DIY Dessert Stands made from candlesticks + wood plaques + spray paint! 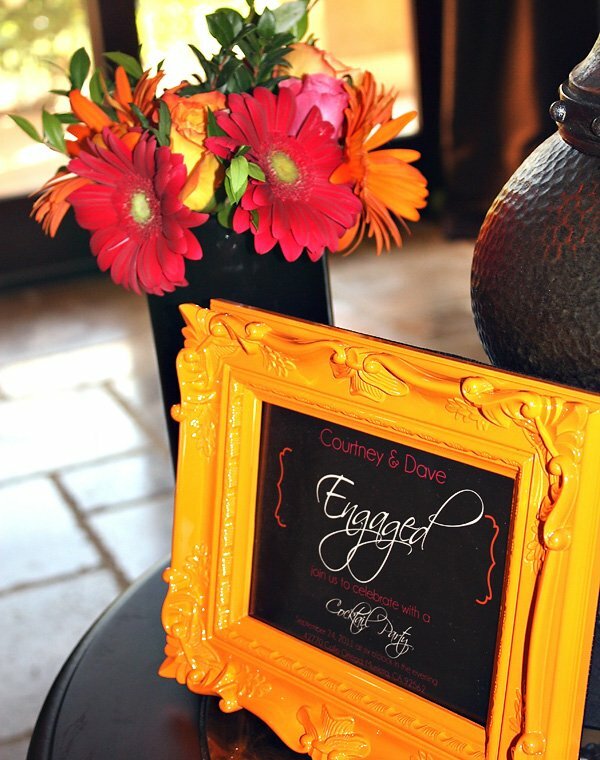 “This engagement party was extra special (and fun!) to plan because it was celebrating the engagement of my sister in law and brother in law to-be (C+D)! The first step was coming up with a theme and a color palette. 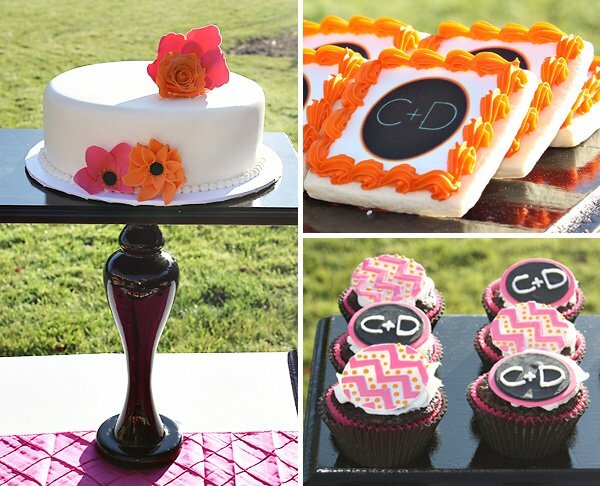 The bride to be wanted a classy, yet whimsical cocktail party and envisioned black with a ‘pop’ of orange and pink – so I ran with it! 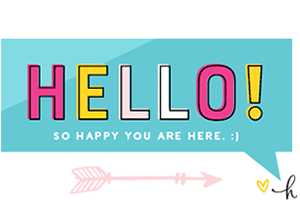 Once I had the concept in my head, I turned to my favorite designer, Kori of Paper and Pigtails to create an invite that would incorporate a custom pattern which we could use not only on the invite, but throughout all of the paper elements at the party. She created a chevron with a polka dot ‘twist’ which I just loved! 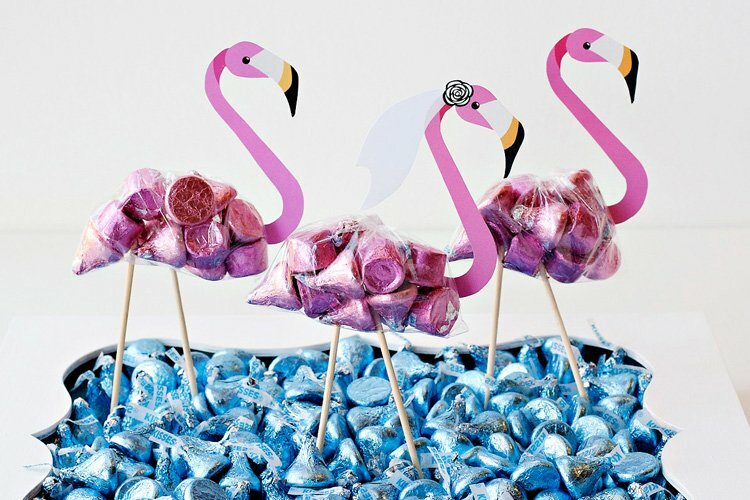 It was on the reverse side of the invite and was such a whimsical surprise – it really set the tone of the whole event. A key to a gorgeous event is finding the right space and this venue was just stunning. 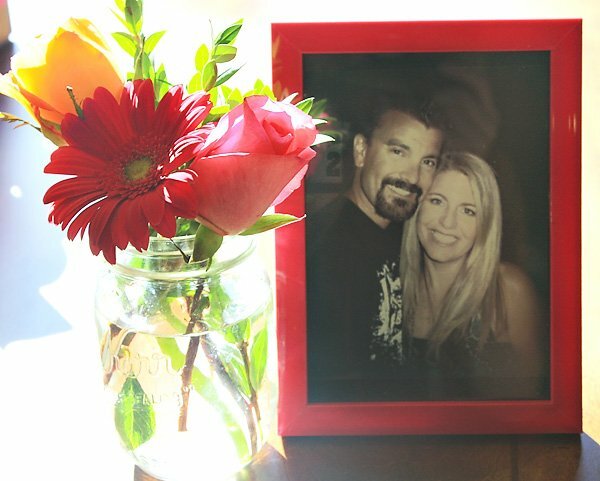 A friend of the couple offered their home (thanks Chuck & Michelle!) and it was such a great backdrop to work with. We strung market lights which illuminated the outdoor space just beautifully at night. 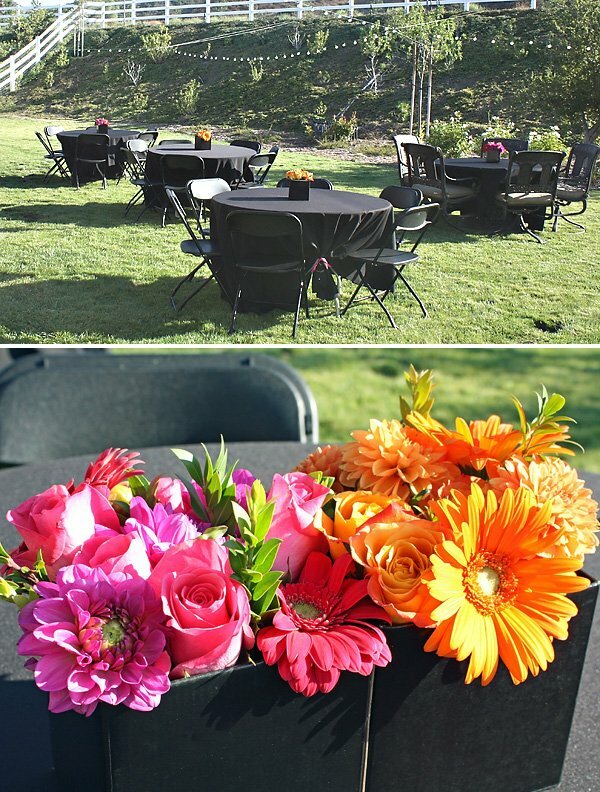 The main décor element of the party were the florals that really ‘popped’ right off the all black tables. 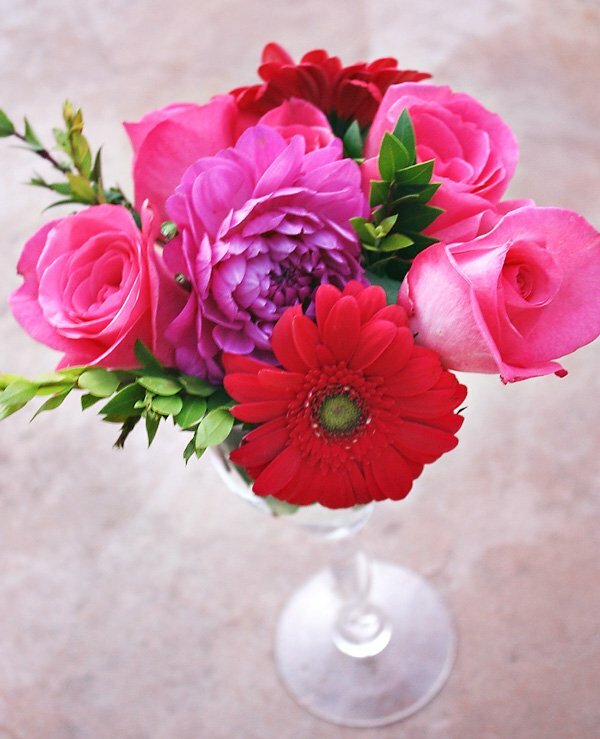 I ordered all of the flowers from our local farmers’ market (such a great way to support local growers and to save money!) and arranged them in black, square Blumeboxes. 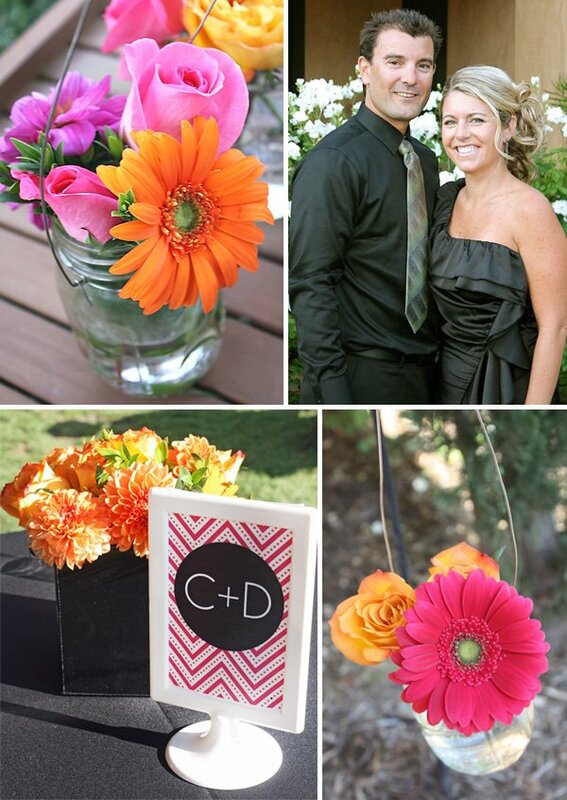 The flowers served as centerpieces on all the outdoor tables as well as indoors, in the entry way and also on the front door on a simple wreath I made. 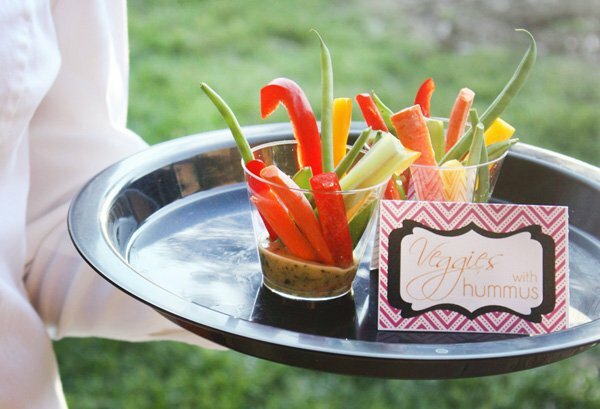 For food, servers tray passed appetizers like Dirty Martini Skewers, Spinach and Feta Pastries, Caprese Meatballs, Sliders with Chipotle Mayo and Fries with Spicy Ketchup – all a huge hit! 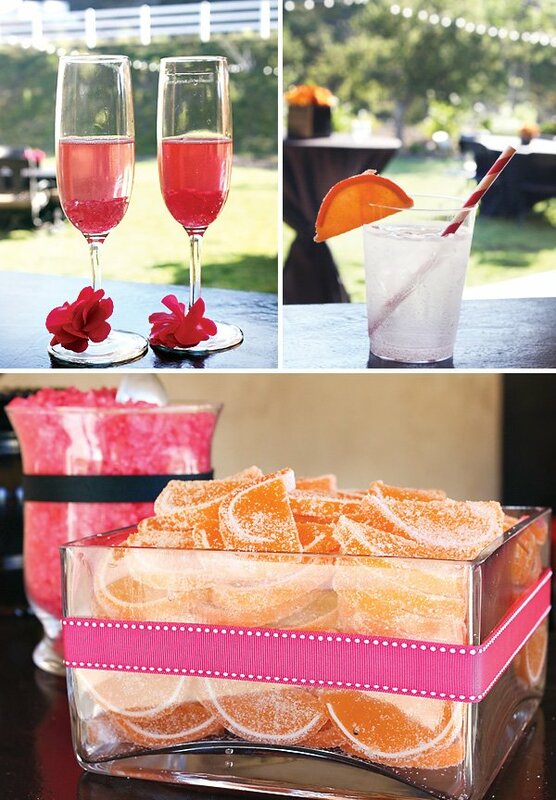 For drinks, the bartender mixed up signature sips like Champagne Cocktails (with hot pink rock candy) and 50/50 Bar Vodka Tonics (adorned with a candy orange slice of course). 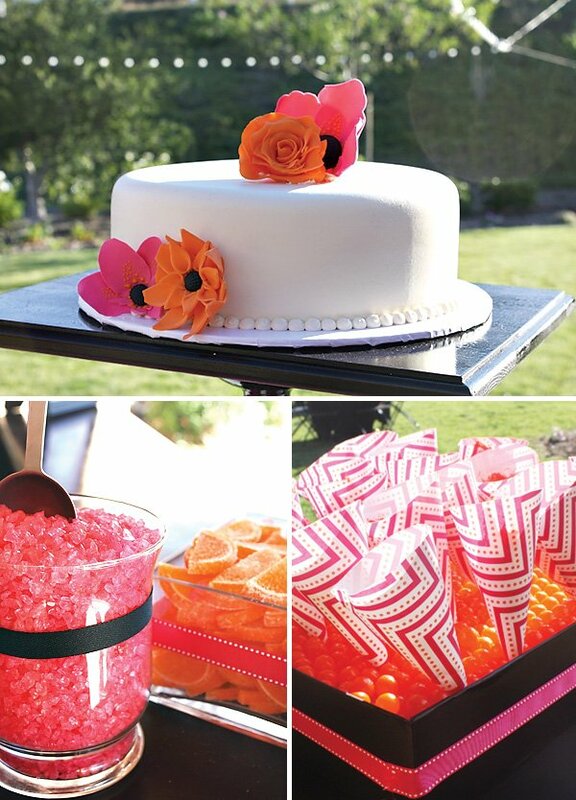 What a gorgeous post, love the idea of the fun floral colors which we can use for any type of cocktail party, so fun and engaging. They give such a wonderful wow effect against the black. 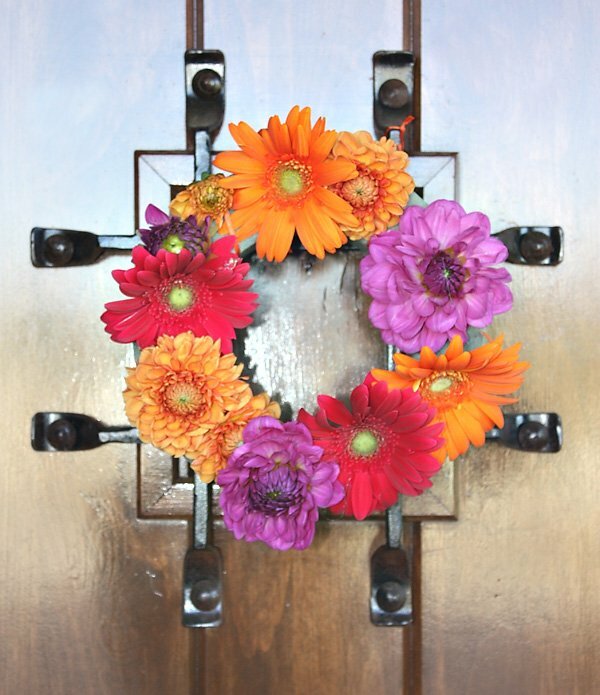 Plus you have a few wreaths, love decorating with them! 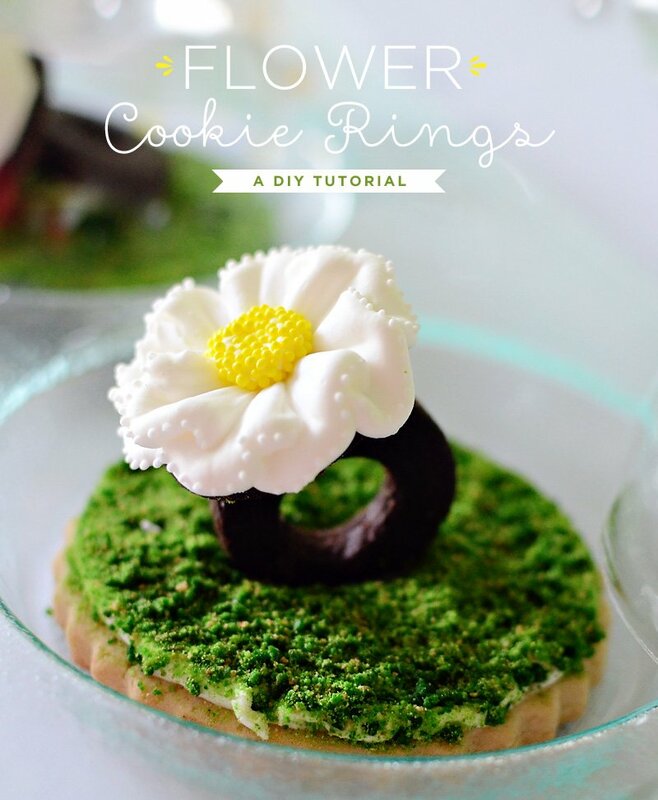 Will you post a tutorial on how you made the cake stands? They are fabulous! They were sooo simple to make (promise)! A tutorial might be a good idea, thanks for the suggestion. 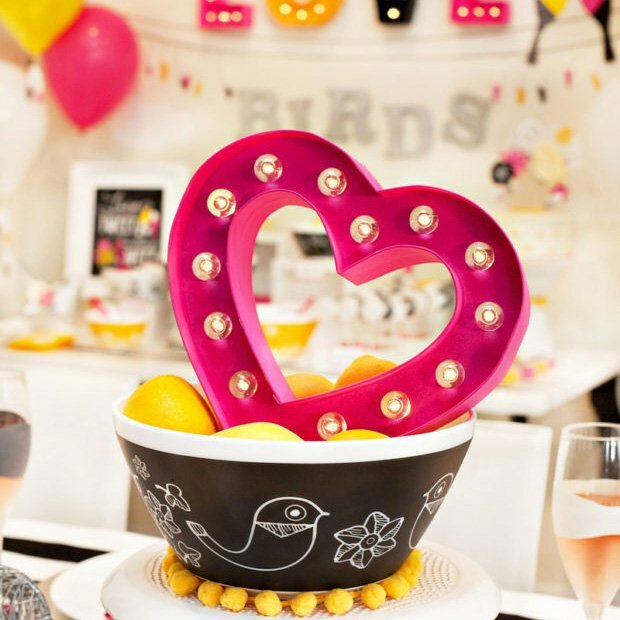 Thank you so much for featuring this party — it was such a special (and fun!) one to plan. Thank you all for the kind words!! It’s so beautiful! I wish them a beautiful long life together. 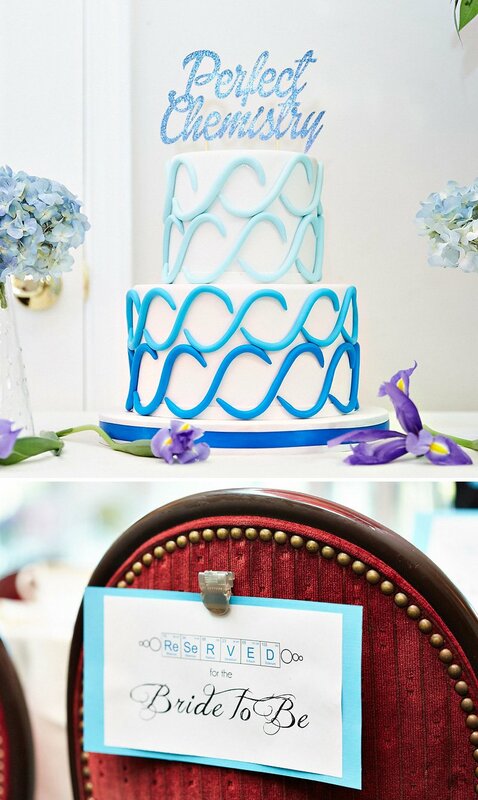 I love the color combo here and those cake stands are beautiful!! Amazing job Tori!